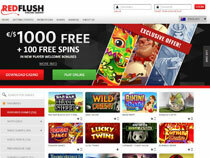 CasinoBonusNews → Casinos → "Red Flush casino"
Red Flush Online Casino is more than a devilish place to hang out. Have you ever wanted to see your name – or at least your initials – scroll across the Internet? Be a big-time winner at Red Flush and you can end up on the scrolling list of fame. With its logo sporting a devil-like tail, but a Web site that caters to its customers by advertising the latest bonuses, winners and progressive jackpot amounts, newcomers to Red Flush may be wondering if they must sell their souls to be a part of this online gambling site. Fear not, because while you are more likely to lose any money you put into a real money account (after all, the house always wins), it is free to download the Microgaming software and look around the interface before committing your money. It’s free to try out the games and use the play money account in both the downloadable casino and the instant play Flash version. Plus, you might pick up some free chips to play with along the way in the form of their matching bonuses, ongoing promotions and loyalty club specials. 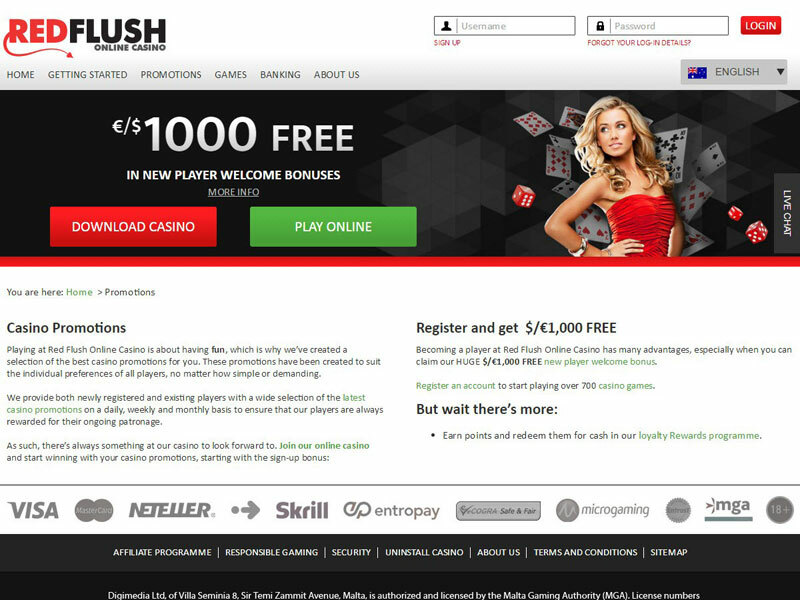 The hosts of Red Flush Casino are currently offering new players their choice of four sign up bonuses, the most popular of which is where players can earn up to $1,000 in bonus money in the first three deposits. This sign up packages also included automatically earning 500 in loyalty points and entry into the loyalty program, an entry into a special weekend freeroll tournament and being able to earn $50 in free credit once a month for six months, as long as the player deposits at least $300 each month. For the gambler who doesn’t mind the pressure of a time limit and some no-strings-attached funding, Red Flush’s second welcome bonus may be more your style. It this no download bonus, each player receives $1,000 and a one hour time clock as soon as they sign up, and the player tries to make as much money as possible within that time. When the hour is up, the $1,000 or what’s left of it disappears, and the player gets to keep anything they have won over that amount. Along with the freeplay bonus, players who choose this package receive matching bonuses on the second and third deposit, entry into the loyalty club program and 500 loyalty points, an entry into a special freeroll tournament and a 100 free spin bonus every month for the next three months. The other two sign up bonuses share a common theme. Both give new players a 50-spin free spin bonus on the video slot machine Thunderstruck II. Players can receive either a 100 percent matching bonus on their first deposit up to $150, or choose the opting of making a deposit of $500 or more and being given $200 in free chips. Both of these offers also come with loyalty reward points and entry into the special freeroll tourney. Need to know how to get cash into a Red Flush real money account? It is as simple as going to the cashiers window in your casino and choosing the deposit method right for you. Red Flush accepts payment through dozens of options, most of them will cause your funds to show up in your account instantly. Options run from the globally-accepted ones, like credit cards, debit cards, Skrill, NETeller, InstaDebit, ClickandBuy and Click2Pay, to the region specific ones like Sofort, Lobanet, GluePay, Euteller, Multibanco, Moneta.ru, POLi, Neosurf and others. Winners needing to withdraw money have fewer options, but they are still safe and reliable. These include Visa credit or debit, Skrill, NETeller, Click2Pay, InstaDebit, uKash, bank transfers or checks sent by either mail or courier. As with any Microgaming-powered casino, anyone who runs into trouble can call up the services of the intelligent 24-hour technical support team, whether through live interactive chat, through calling by telephone or writing an email. Once you have signed on and gotten the finances out of the way, you can make your way through the Red Flush list of slot machines and table games. You can find slot machines in every variety, with the excellent graphics and excitement expected from a Microgaming casino. There will be video poker machines, some that give you the chance to play up to 100 hands in one round, some that give you the chance to level-up or earn a multiplier after a successful hand and some that have progressive jackpots. You can choose to play keno, baccarat, craps, blackjack or roulette. After playing enough rounds, you may find the casino is rolling out the red carpet for you, receiving special offers, better bonuses and even tickets to exclusive trips and events through the VIP Loyalty Program.